William Morrow Cookbooks, 9780062476616, 352pp. 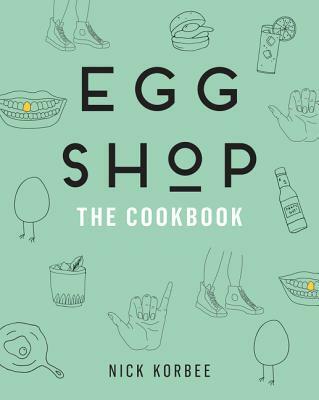 An appealing, stunningly designed full-color cookbook featuring more than 100 recipes for favorite food and drinks from the Egg Shop, New York City’s beloved all-hours brunch-and-cocktails hangout. For first-time restaurateurs Demetri Makoulis and Sarah Schneider and chef/partner Nick Korbee, eggs aren’t just an easy, protein-packed breakfast go-to, but an extraordinary complement to New York’s wealth of local produce and artisanal meats, grains, and cheeses. With Egg Shop anyone can create their delicious Egg Shop experience at home—whether it’s a quiet breakfast for one or a boozy brunch for twenty. Inside you’ll find proper egg-cooking techniques as well as instructions on incorporating eggs into super-delicious dishes from the health-conscious to the decadent, using fresh, delicious ingredients: homemade seeded rye bread, the best-quality bacon, and the perfect melting cheese. After mastering the most common and useful egg cooking methods (scrambled, poached, fried) Nick Korbee teaches you how to unlock egg superpowers—coddling them in Mason jars full of truffle oil and basting them with coffee-infused compound chocolate-bacon butter. The California Breakfast Burrito and more! Infused with the creativity and playfulness that makes Egg Shop a one of a kind culinary treasure, Egg Shop is the home cook's perfect egg-scape.